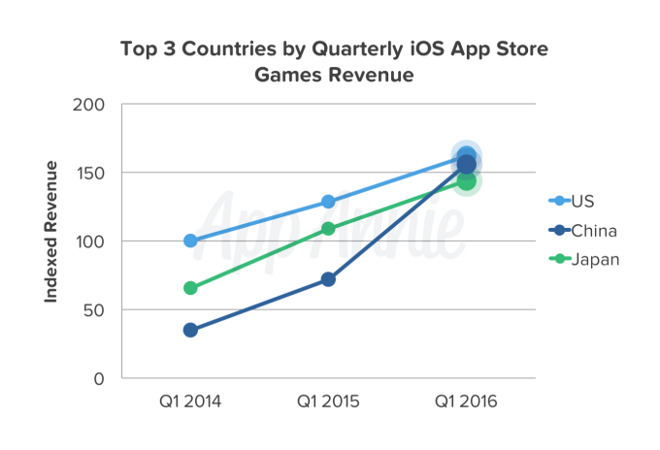 In the March quarter, revenues from the Chinese iOS App Store surpassed Japan for the first time —showing them on a course to eventually top the U.S, according to estimates published on Friday. The country's Q1 2016 revenues just barely beat Japan, said app analytics firm App Annie. Although China's performance has been on the increase for some time, it appears to have accelerated by almost 2.2 times between the first and second quarters of 2015, and remains on a high track. App Annie noted that much of the region's growth has come from in-app purchases, and especially a handful of games such as Fantasy Westward Journey and Hero Moba. Many iOS games are now free to download but instead make money by charging for in-game items, characters, or currency, sometimes making progress slow or impossible without paying. Indeed, one of the firm's charts shows that the U.S, China, and Japan are not very distant from each other in terms of games revenue. 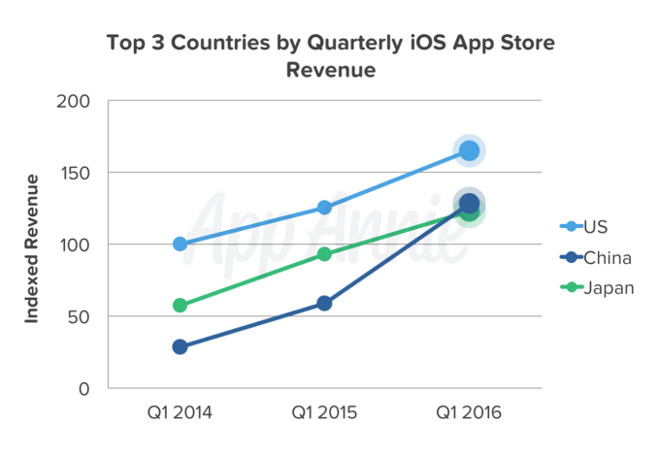 With a 30 percent gap, China is still relatively distant from displacing the U.S. in general app revenue. The country could assume the top spot as soon as this year however, or possibly in 2017.